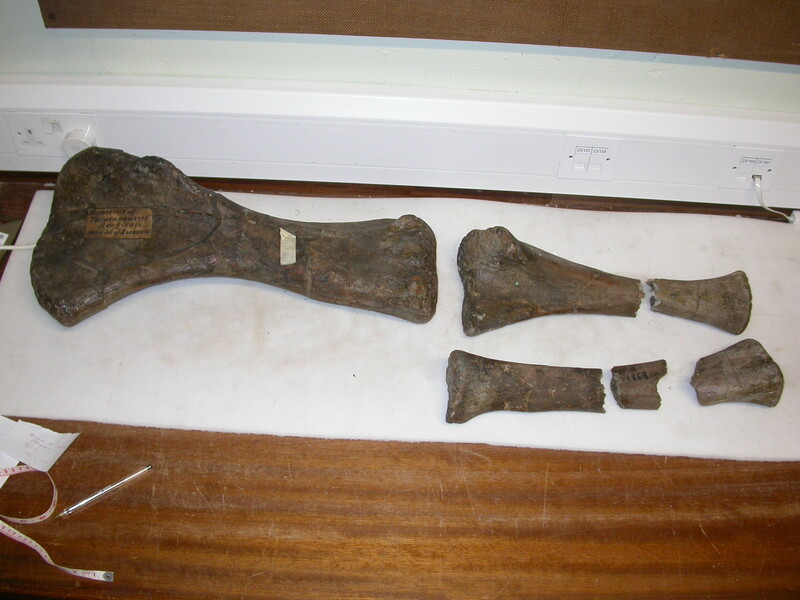 We’ve seen the humerus of the Wealden-supergroup putative titanosaur “Pelorosaurus” becklesi. We’ve seen the bones of the forearm, the radius and ulna. That’s it for bony remains: no other bones have been found. A portion of the scaly cuirass which covered the limbs and is composed of hexagonal plates, was exhibited. 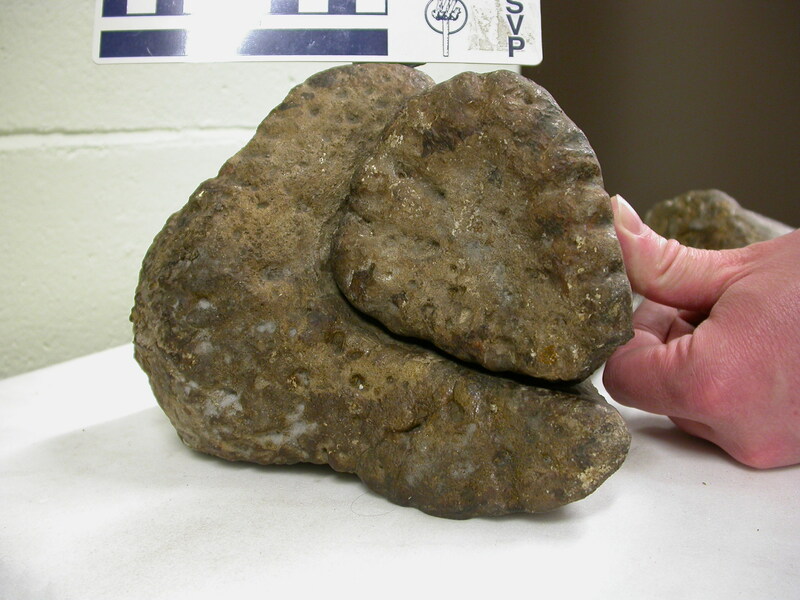 This skin impression was found in close association with the elbow region of the forelimb of Pelorosaurus becklesii. But I don’t know whether this assertion is based on something written earlier, or is just a surmise. 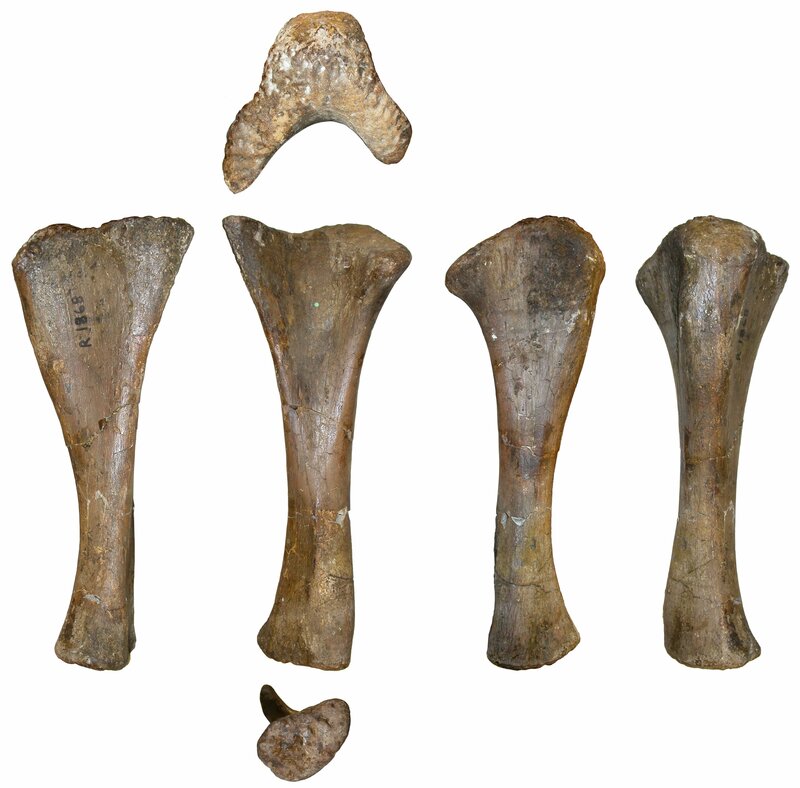 Schematic of “Pelorosaurus” becklesi holotype NHMUK R1870, showing the preserved humerus, radius, ulna, and skin impression of the elbow. Based on Scott Hartman’s skeletal reconstruction of Alamosaurus. This is not a skeletal reconstruction of “Pelorosaurus” becklesi. It’s not much, but it’s enough to be diagnostic. But what actually is this beast? A titanosaur, as often assumed? A more basal macronarian? Something else entirely? Who can tell? Someone really ought to get onto that. Mantell, Gideon A. 1852. On the structure of the Iguanodon, and on the fauna and flora of the Wealden Formation. Notices of the proceedings at the meetings of the members of the Royal Institution, with abstracts of the discourses delivered at the evening meetings 1:141-146. 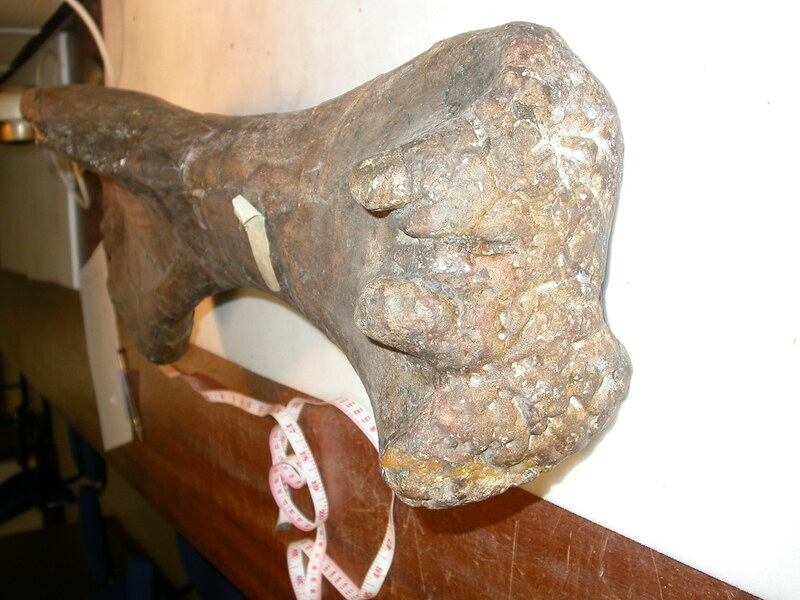 It’s an oddity that in eight years of SV-POW!, we’ve never written about one of the best of all the Wealden-formation sauropod specimens: the forelimb and associated skin impression NHMUK R1870 that is known as “Pelorosaurus” becklesii. 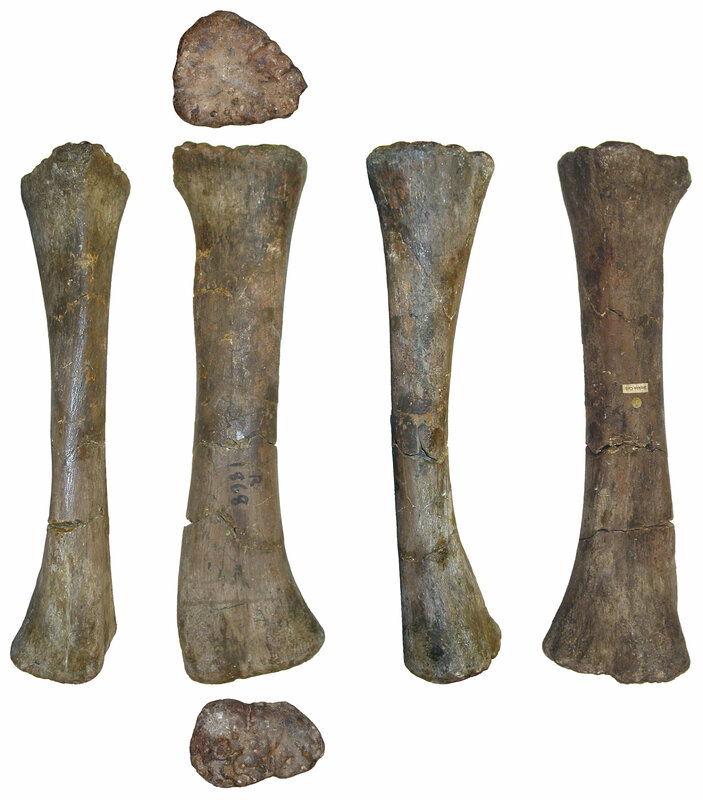 Left forelimb material of “Pelorosaurus” becklesii holotype NHMUK R1870. 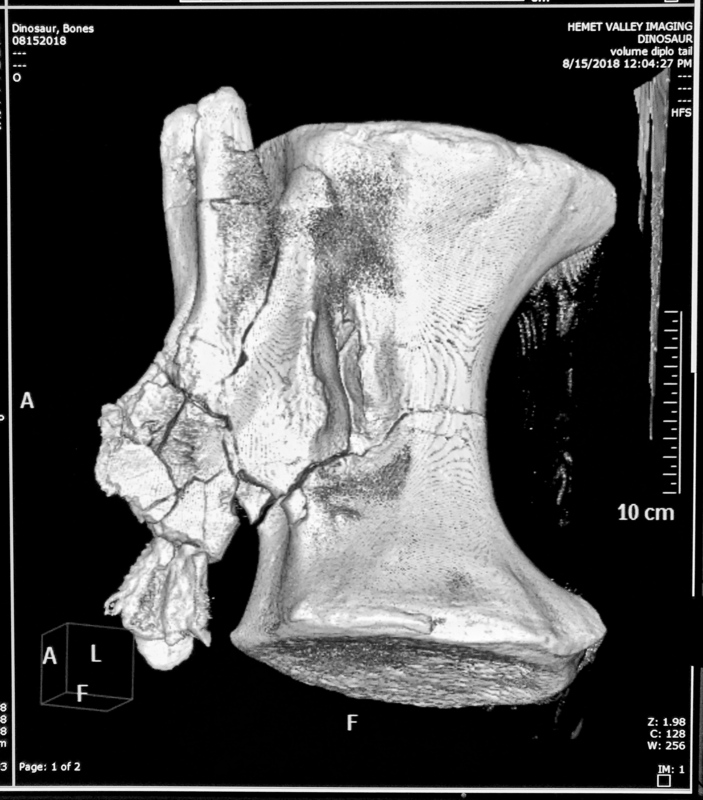 Left: humerus, in posterior view. Right, from top to bottom: ulna in anterior view; radius in anterior view. Yes, I should have turned the humerus over before taking this photo. What can I tell you? I was young and stupid then. 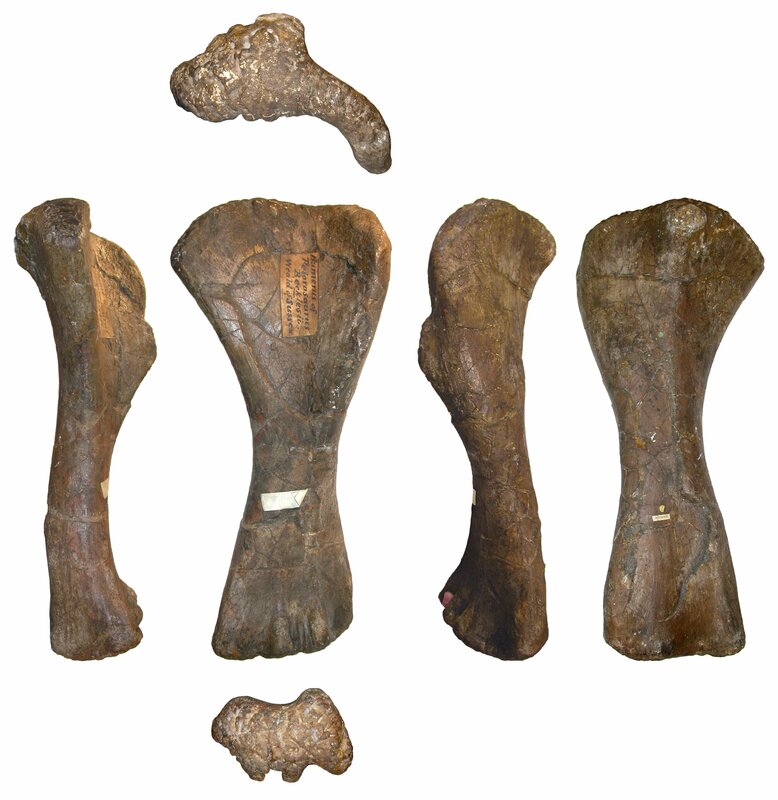 Breakage in bones of the lower left forelimb of “Pelorosaurus” becklesii holotype NHMUK R1870. Left: proximal part of radius in distal view. Right: proximal part of ulna in distal view. I wish I knew enough about mineralisation to comment intelligently on what we can see there. If anyone has thoughts, do leave them in the comments. 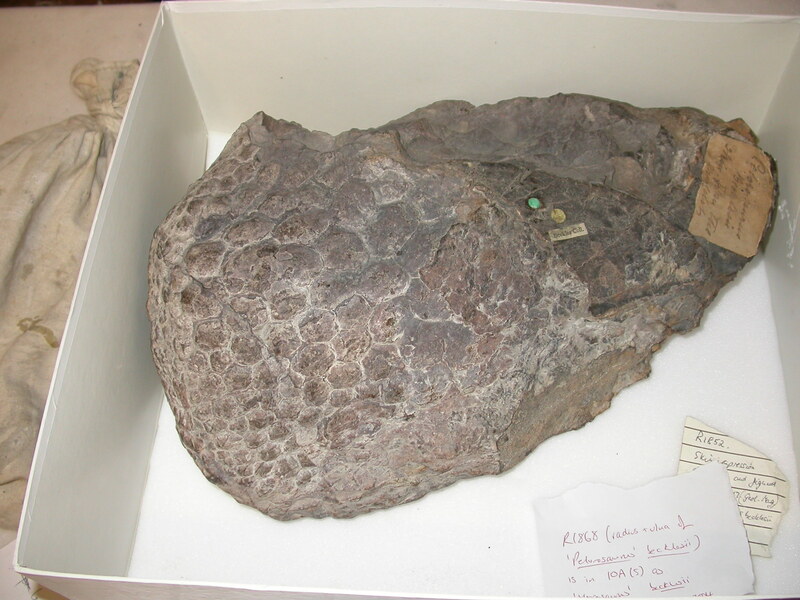 “Pelorosaurus” becklesii holotype NHMUK R1870, left humerus. Top row: proximal view, with anterior to the bottom. Middle row, from left to right: medial, anterior, lateral and posterior views. Bottom row: distal view, with anterior to the top. As you can see it’s in really nice shape, and pretty distinctive. 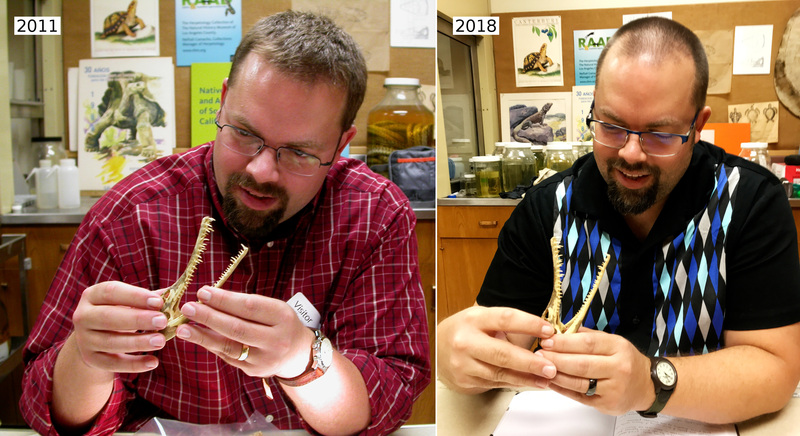 Way back in my 2007 Progressive Palaeo talk (Taylor 2007), I coded up the humerus (alone, without the other elements) in the Harris-based phylogenetic matrix that I’ve used repeatedly in other projects. It came out as the sister taxon to the titanosaur Malawisaurus (which in that matrix comes out fairly basal within Titanosauria): in fact, it could hardly do anything else, since the coding was exactly the same as that of Malawisaurus. 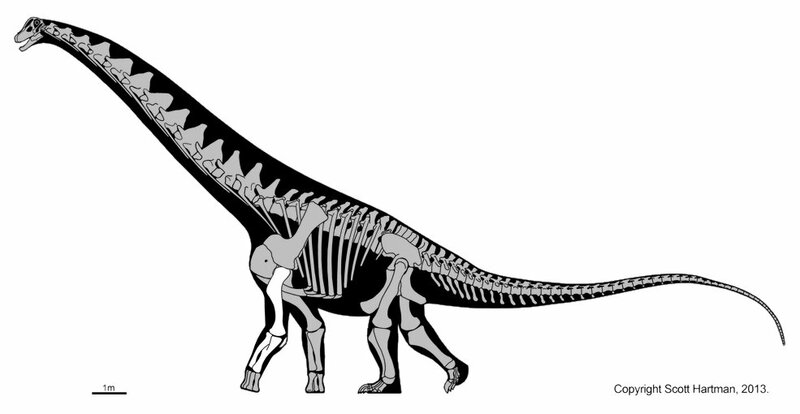 And indeed it’s been pretty widely accepted that “P.” becklesii is a titanosaur — one of the earliest known, and the only name-bearing one from the Wealden Supergroup, unless you count the extremely indeterminate Iuticosaurus, which predictably enough is based on a single eroded partial mid-caudal centrum. Still, the titanosaurian identity of “P.” becklesii has never been convincingly demonstrated — only inferred by non-cladistic means. 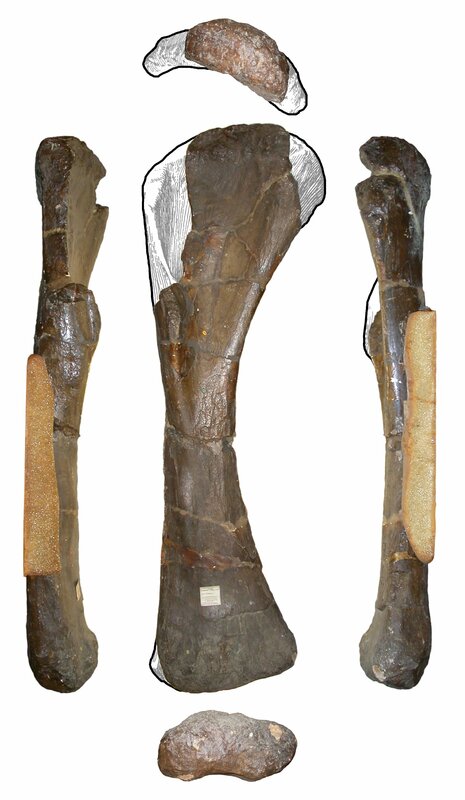 “Pelorosaurus” becklesii holotype NHMUK R1870, left humerus in anterodistal view (anterior to the left). So why the quotes around the genus name “Pelorosaurus“? Because it’s long been recognised that, whatever this specimen might be, it ain’t Pelorosaurus, which is based on the “Cetiosaurus” brevis caudals and a much more slender humerus. 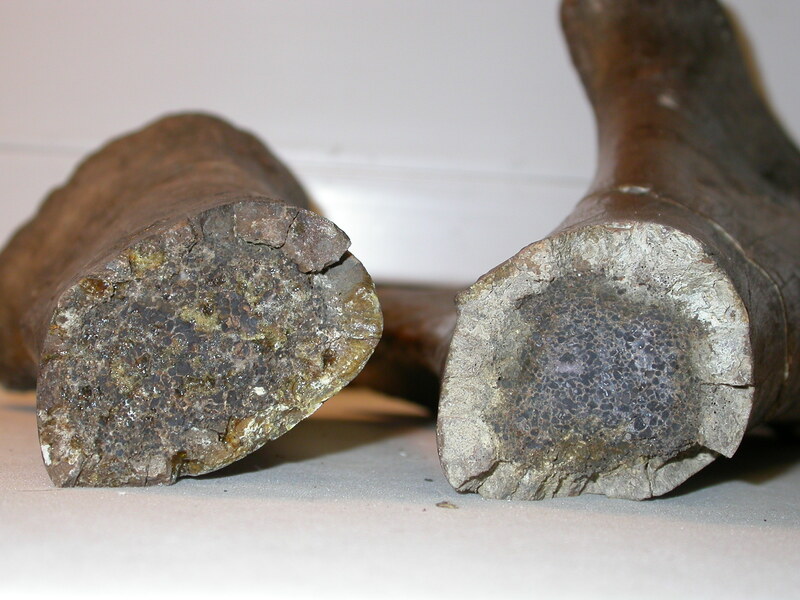 The only reliable Lower Cretaceous titanosaurid material, apart from Malawisaurus, comes from Europe, especially England. The earliest of these forms may be represented by the forelimb of ‘Pelorosaurus becklesii‘ (Mantell 1852) from the Valanginian of Sussex. This specimen was considered to be Sauropoda incertae sedis by McIntosh (1990b). However, a skin impression shows polygonal plates of a similar shape and size to those found in Saltasaurus (Bonaparte & Powell 1980). 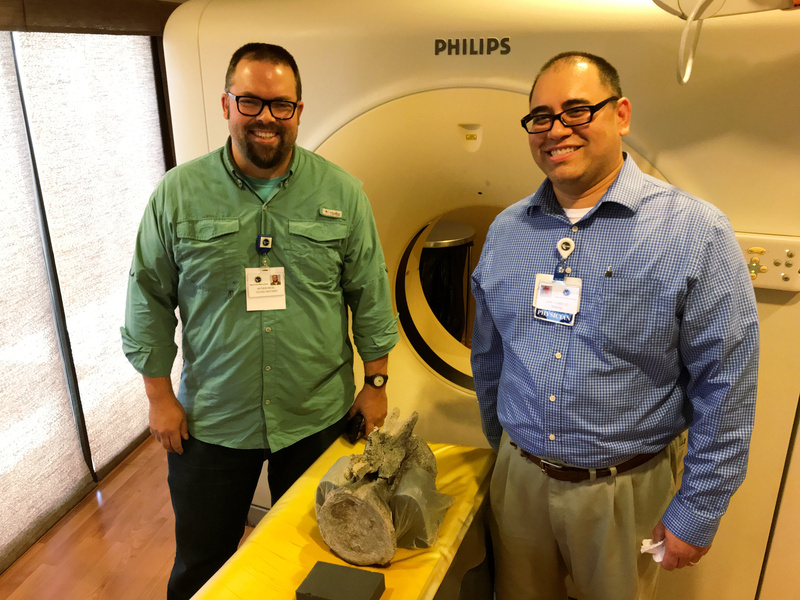 The ulna and radius are robust and the ulna bears the typical concavity on its anteromedial proximal process. Upchurch (1993) therefore argued that this form should be provisionally included within the Titanosauridae. Given my interest in the Wealden, it’s surprising that we’ve never blogged about “Pelorosaurus” becklesii before, but it’s true: I’ve mentioned it three times in comments, but never in a post. It’s good to finally fix that! Next time: the radius and ulna. Janensch, Werner. 1961. Die Gliedmaszen und Gliedmaszengurtel der Sauropoden der Tendaguru-Schichten. Palaeontographica (Suppl. 7) 3:177-235. Taylor, Michael P. 2007. Diversity of sauropod dinosaurs from the Lower Cretaceous Wealden Supergroup of southern England. p. 23 in Graeme T. Lloyd (ed. ), Progressive Palaeontology 2007, Thursday 12th-Saturday 14th April, Department of Earth Sciences, University of Bristol. 38 pp. Upchurch, Paul. 1993. The Anatomy, Phylogeny and Systematics of Sauropod Dinosaurs. Ph.D dissertation, University of Cambridge, UK. 489 pages. Upchurch, Paul. 1995. The evolutionary history of sauropod dinosaurs. Philosophical Transactions of the Royal Society of London Series B, 349:365-390. Upchurch, Paul, Paul M. Barrett and Peter Dodson. 2004. Sauropoda. pp. 259-322 in D. B. Weishampel, P. Dodson and H. Osmólska (eds. ), The Dinosauria, 2nd edition. University of California Press, Berkeley and Los Angeles. 861 pages. Upchurch, Paul, Philip D. Mannion and Paul M. Barrett. 2011. Sauropod dinosaurs. pp. 476-525 in: Batten, David J. (ed. ), English Wealden Fossils. The Palaeontological Association (London). How dense are birds? Some new (old) data. Also, hummingbirds and ketchup. I recently reread Dubach (1981), “Quantitative analysis of the respiratory system of the house sparrow, budgerigar and violet-eared hummingbird”, and realized that she reported both body masses and volumes in her Table 1. For each of the three species, here are the sample sizes, mean total body masses, and mean total body volumes, along with mean densities I calculated from those values. * This is the species examined by Dubach (1981), although not specified in her title; there are four currently-recognized species of violetears. And apparently ‘violetear’ has overtaken ‘violet-eared hummingbird’ as the preferred common name. And as long as we’re technically on a digression, I’m almost certain those volumes do not include feathers. Every volumetric thing I’ve seen on bird masses assumes plucked birds (read on). There are relatively few values for bird density. Welty (1962) cited 0.9 g/mL for a duck, and Alexander (1983) 0.937 g/mL for a domestic goose, but those values may not take account of the air sacs. Paul (1988) noted 0.8 g/mL for unspecified bird(s). To provide more reliable estimates, the density of 25 birds of 12 species was measured by using the volume displacement method. In a dead, plucked bird the air-sac system was reinflated (Saunder and Manton 1979). The average density was 0.73 g/mL, suggesting that the lungs and air sacs occupy some quarter of the body. 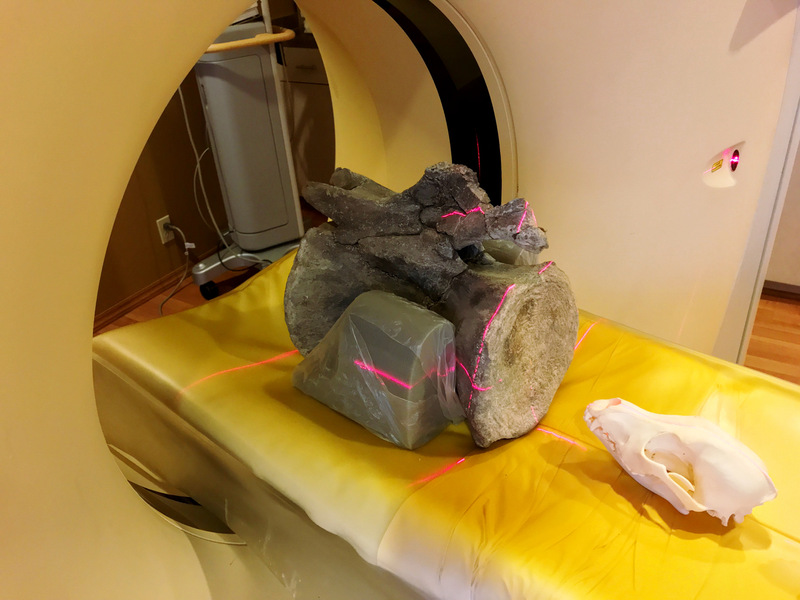 That result has cast a long shadow over discussions of sauropod masses, as in this paper and these posts, so it’s nice to see similar results from an independent analysis. If you’re curious, the weighted mean of the densities calculated from Duchard’s Dubach’s (1981) data is 0.77. I’d love to see the raw data from Hazlehurst and Rayner (1992) to see how much spread they got in their density measurements. Unfortunately, they did not say which birds they used or give the raw data in the paper (MYDD! ), and I have not asked them for it because doing so only just occurred to me as I was writing this post. Yes, those are its hyoids wrapped around the back of its head–they go all the way around to just in front of the eyes, as in woodpeckers and other birds that need hyper-long tongue muscles. There are LOADS of other interesting things to talk about here, but it will be faster and more productive if I just go write the paper like I’m supposed to be doing. Oh, all right, I’ll say a little more. This is a young adult female Anna’s hummingbird, Calypte anna, who was found by then-fellow-grad-student Chris Clark at a residential address in Berkeley in 2005. She was unable to fly and died of unknown causes just a few minutes after being found. She is now specimen 182041 in the ornithology collection at the Museum of Vertebrate Zoology at Berkeley. Chris Clark and I had her microCTed back in 2005, and that data will finally see the light of day thanks to my current grad student, Chris Michaels, who generated the above model. This bird’s skull is a hair over an inch long, and she had a body mass of 3.85 grams at the time of her death. For comparison, those little ketchup packets you get at fast-food burger joints each contain 8-9 grams of ketchup, more than twice the mass of this entire bird when it was alive! Dubach, M. 1981. Quantitative analysis of the respiratory system of the house sparrow, budgerigar and violet-eared hummingbird. Respiration Physiology 46(1): 43-60. Hazlehurst, G.A., and Rayner, J.M. 1992. Flight characteristics of Triassic and Jurassic Pterosauria: an appraisal based on wing shape. Paleobiology 18(4): 447-463.